SCCM is having reports with too much information’s. But most of these are irrelevant for our use. So I think it’s always better to have your own way of reports by writing custom queries. One of my customer requested that they want to monitor all computers that plugging USB storage devices and time. I have searched this on SCCM and other forums, but couldn’t find anything, but there is lot of reports giving so many details on USB devices. So I have opened the SCCM database tables and wrote a custom query. Then add this query to a report. Customize it. And create an email subscription to this report. Now every morning IT manager will get a report on all the computers and time of USB pen drives are plugged in. tell me its not cool. 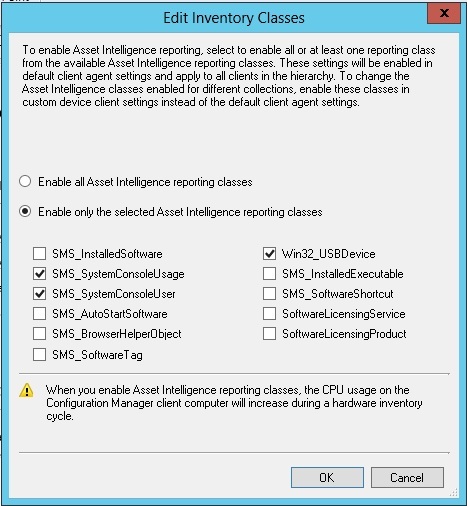 Enable Asset IntelligenceAssent intelligence should be enabled and you have to enable the Win32_USBDevice inventory Class. If you are doing this first time then you have to wait till next hardware cycle to complete. Then only all the USB device information will populate to the database. I have created the following script to get required information. This script gather data from two tables USB_DEVICE_DATA and USB_DEVICE_HIST. second table is the history table. And I will filter these data only for USB Storage devices (USBSTOR). I only required knowing the computer that USB flash drives have plugged in and the time. So I have only generating the SystemName00 and TimeKey column. This query will produce the list of computers of all time. But in my scenario I only need to know USB storage devices that plugged in on last 2 days. So I have modified the SQL query to following. In SCCM console select monitoring tab, right click on reports and select create report. Click Fields and it will automatically add fields. Select the created dataset Next, then Drag two fields to the Values. Click Next and select the style and finish. Add your report headers, Logos and everything that your requirements and Save the report. Select the Report from Console and click Run. 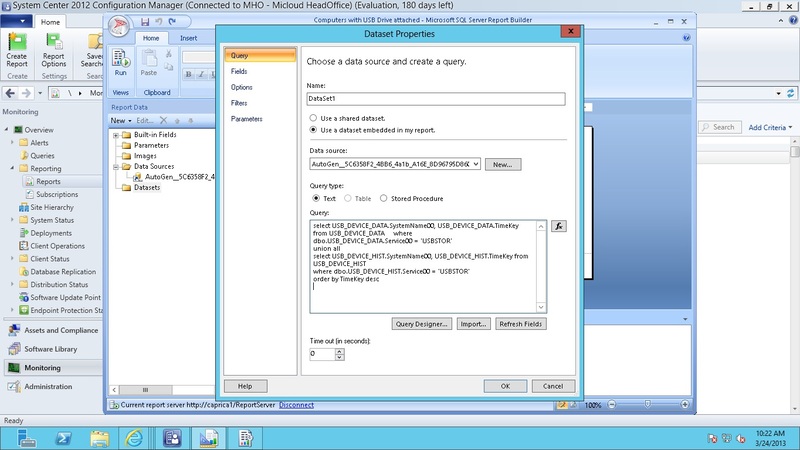 If your SCCM database is populated with data, following report is displayed. 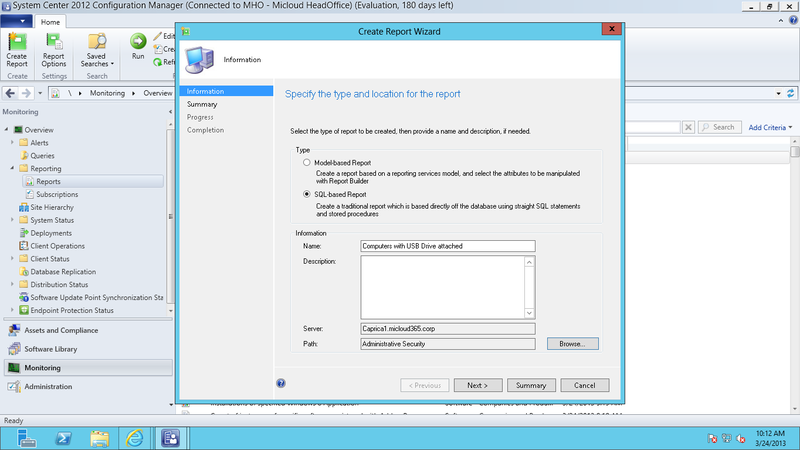 Note – all data will report after the Hardware cycle of SCCM Client. when Same USB plugged to the same computer, Hardware cycle should run in middle. Very helpful article! I have now implemented this in our organisation. 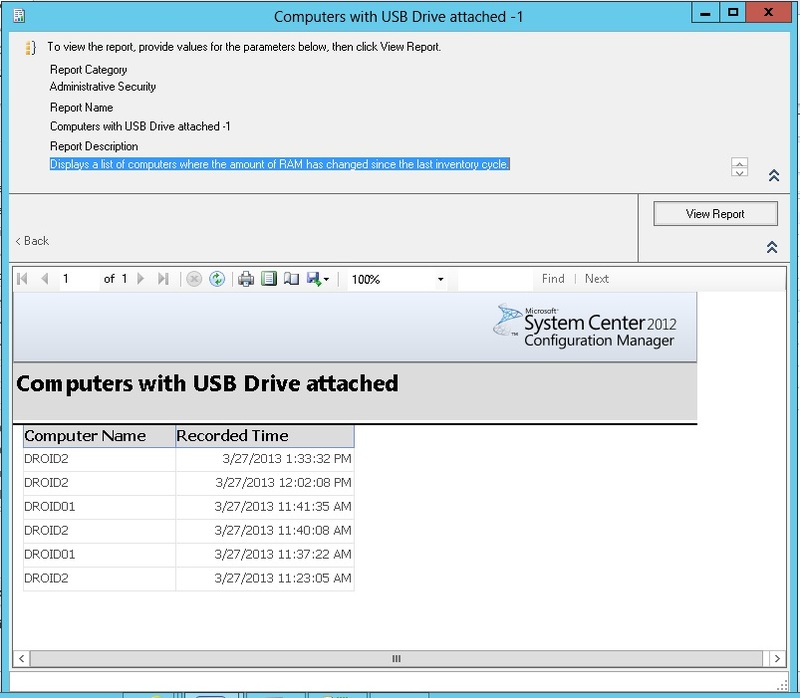 Do you know if SCCM can also tell when USB’s are unplugged and how to add this to the report? It did work.. but is showing incorrect information. Showed USB as connected@ 11 PM with nobody using or connected to the server locally or remotely. Plus no related events.. Not sure what’s happening here..